Armando Thomas "Mondo" Guerra (born June 6, 1978) is a Mexican-American fashion designer who finished as runner-up on Season 8 of Project Runway, and later won the series' first season of Project Runway All Stars. After coming out as HIV positive on the show, Guerra has become a spokesperson for two national HIV campaigns — Merck's Project I Design and Subaru's Dining Out For Life. Guerra was also the first contestant on the show to come from Denver, Colorado. Guerra is a fifth-generation Mexican-American from the Denver area. He attended high school at the Denver School of the Arts. In 2001, when living in New York City, he tested HIV positive, at the age of 22. He didn't start antiretroviral therapy until several years later and struggled with adherence, experiencing several side effects and being hospitalized more than once later in the 2000s. In an interview he has spoken about struggling with AIDS in the American healthcare system and reliance on Ryan White programs as well as suffering from depression and keeping his HIV status secret, including from his family. He has also spoken about HIV stigma and "AIDS phobia" within the gay community. Guerra was on the eighth season of Project Runway, aired in 2010. After placing in the top, but not winning, on a number of challenges, then placing in the bottom but not being eliminated in the seventh (Resort Wear Challenge) episode, he won the challenges on the eighth (Jacqueline Kennedy Challenge), ninth (L'Oreal Makeup Challenge) and tenth (HP Pattern Challenge) episodes. He also won $20,000 for the ninth challenge, which involved both a "couture" look and a "ready-to-wear" look. During the tenth challenge, after a question from Nina García and without having expected to do so, he revealed to the judges that his pattern of bright, bold plus signs on a pant was inspired by his HIV+ status, and that he had been keeping his HIV status a secret for ten years; in interview he mentioned that the schedule was particularly difficult for his medication adherence, despite coming shortly after a very low CD4 count. He had not previously disclosed his HIV status to his family and the show's producers and Tim Gunn spoke with him about how he wanted to handle the issue; Guerra has described feeling a sense of relief and self-love at going public with his status. He finally disclosed to his family shortly before the tenth challenge was broadcast. With a collection themed on the Day of the Dead  fan favorite Guerra came in second place in the final competition held at Mercedes-Benz Fashion Week at the Lincoln Center for the Performing Arts in New York City. Oregonian Gretchen Jones took first place, and Hawaiʻan Andy South — now Ari South — came in third. Project Runway executive producer Heidi Klum — who had pushed for Guerra to win over Jones in a lengthy  split debate over the winner — appeared in a modified version of one of Guerra's final collection gowns for the Los Angeles premiere of the movie Black Swan a few weeks after the airing of the final episode. Guerra was the winner of the 2012 series Project Runway All Stars, beating out season 1 designer Austin Scarlett and close friend from season 8 Michael Costello. On November 30, 2010, Guerra appeared with Liza Minnelli, Kenneth Cole and Cheyenne Jackson on the trading floor of the New York Stock Exchange to ring the opening bell on behalf of amFAR, to usher in World AIDS Day. Also in commemoration of World AIDS Day, he designed a limited edition of T-shirts, one with a Day of the Dead sugar skull and one with a tree of life. These shirts were sold on Piperlime.com starting at midnight on December 1, 2010. For each shirt sold, $20 was donated to amfAR. In his statement to Fox News Latino for his motivations in doing this, he said, "The Day of the Dead is celebration of our loved ones who have passed. When I was thinking of World Aids day I wanted to create something very true to who I am, and what I know. Who I've known and miss and those people in my life that still fight this disease. It's about love and continuation." In the season 10 finale episode of the hit reality competition show RuPaul’s Drag Race, contestant Blair St Clair appeared wearing a gown designed by Guerra himself. The gown was highly appraised, with many calling it the best look from the episode. It was also rewarded the “Top Toot of the week” by the show’s official fashion review online series, Fashion Photo Ruview. ^ a b c Joanne Ostrow (October 28, 2010). "Designer Mondo Guerra's fans stunned by his Project Runway loss". The Denver Post. Retrieved May 6, 2017. ^ "A little more personal (raw) with... Mondo Guerra". Loverboy. 2016. Retrieved May 6, 2017. ^ Jef Otte (July 29, 2010). 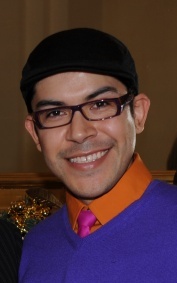 "Designer Mondo Guerra plans to make a splash as Denver's first contestant on Project Runway". Westword. Retrieved May 6, 2017. ^ Joanne Ostrow (August 16, 2010). "Ostrow: Denver's reality designer basks in limelight". The Denver Post. Retrieved May 6, 2017. ^ a b c d e f g h Kellee Terrell (October 19, 2010). "Mondo Guerra of Project Runway Talks About Living With HIV and the Power of Disclosure". This Positive Life. TheBody.com. Retrieved May 6, 2017. ^ a b c Louise Rafkin (December 19, 2010). "Project Runway: Mondo Guerra, Michael Costello". San Francisco Chronicle. Retrieved May 6, 2017. ^ a b c d Carolyn Salazar (December 1, 2010). "Mondo Commemorates World AIDS Day with, Um, Skulls". Fox News Latino. Archived from the original on December 18, 2010. Retrieved May 6, 2017. ^ a b JamesMichael Nichols (October 24, 2013). "Ari South, transgender Project Runway contestant, talks return to television". Huffington Post. Retrieved May 6, 2017. ^ Joyce Lee (October 29, 2010). "Project Runway season 8 declares a Winner". CBS News. Retrieved May 6, 2017. ^ Kyle Buchanan (November 2, 2010). "Tim Gunn Was Enlisted by Heidi Klum to Sway Project Runway's Final Vote Toward Mondo". Vulture.com. Retrieved May 6, 2017. ^ "Mondo Guerra on Designing a Dress for Heidi Klum in Just One Day!". People. November 12, 2010. Retrieved May 6, 2017. ^ Chris Rovzar (December 1, 2010). "George W. Bush Has Some 'Friendly Advice' for Congress on World AIDS Day". New York. Retrieved May 6, 2017. ^ a b "Support World AIDS Day with Mondo Guerra's limited-edition Tees for Piperlime". PopSugar. December 1, 2010. Retrieved May 6, 2017. This page was last edited on 28 March 2019, at 16:52 (UTC).